The flow of illegal immigrant children into the United States is expected to rise to record-breaking numbers in 2016 as deportations decrease, according to leading members of the Senate’s Judiciary Committee. 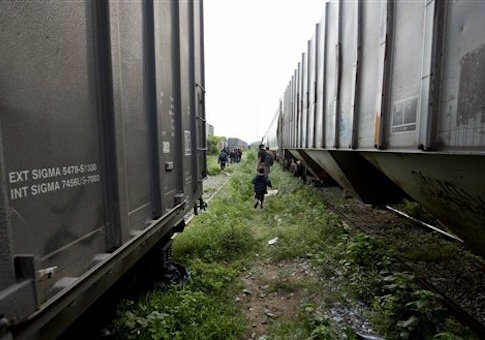 At least 20,455 unaccompanied minors have been caught during fiscal year 2016 along the U.S.-Mexico border as of last month, according to committee chairman Sen. Chuck Grassley (R., Iowa), who warned that if this trend continues, the number of illegal minors could eclipse a massive 2014 surge that strained the resources of the Department of Homeland Security and prompted investigations into the Obama administration’s handling of the issue. While illegal border crossings surge, the number of children actually being deported from the United States is declining, senators said during a Tuesday hearing with senior Obama administration officials. The hearing comes just a day after oversight officials disclosed that the Obama administration has lost track of scores of immigrant children, many of whom are being released from custody to individuals across the United States who have not gone through thorough background checks. "If these trends continue, we can expect to see an even greater number of minors crossing the border this year than in 2014," Grassley said. "No one is following up on these individuals when they skip their immigration hearings, unless they are receiving post-release services. They are also not enforcement priorities for this administration. This means a lot of these minors are nowhere to be found." Thomas Homan, a top official in the U.S. Immigration and Customs Enforcement’s Office of Enforcement and Removal Operations, confirmed that trials for these illegal immigrants could take "months or years" to complete. "It is no wonder children are being mistreated or simply falling off of the grid once turned over to sponsors," Grassley said. "Your agency wants to wipe its hands clean after a child is placed with a sponsor." As border crossings rise to unprecedented levels, the Obama administration has deported just 4,680 of more than 127,000 minors who were apprehended on the border during the past two-and-a-half years. Obama administration officials confirmed that third-party contractors perform most background checks and interviews with these minors, often with little government oversight. "We’re having an increase … this year, twice as many unaccompanied minors are entering the country as last year because there’s no effective response to this," Sen. Jeff Sessions (R., Ala.) said. "The president’s answer is to assume basically that every child is a victim of an asylum type danger and entitled to enter the U.S."
Sessions grilled Homan about the deportation process, asking if a greater number of removals from the United States could impact the border issue. "They’re difficult to find," Homan responded, admitting that a greater number of deportations would likely deter immigrants from illegally entering the United States. "They should be, if caught, they should be treated fairly and sent home," Sessions said. "That’s what needs to be done. That’s what the law says. That’s what the American people want. But we have an administration that’s undermining every day the ability of that system to work." "It cannot be that every young person that appears from Central America is entitled to asylum or entry into the United States, contrary to our laws," he said. "It just cannot be." Homan also admitted that once a child is released from custody it can be difficult to compel them to appear before immigration judges for deportation proceedings. This entry was posted in National Security and tagged Illegal Immigration, Immigration Reform. Bookmark the permalink.